Beautifully engraved certificate from the Santa Anna First Mortgage Bond issued in 1866. This historic document was printed by Nathan Lane and has an ornate border around it with a vignette of the Palace of Turbaco and the Palace of St. Thomas and a bust pose of General Santa Anna at the left. This item has the signatures of A.L. de Sta. Anna and is over 149 years old. Small �-inch orange seal, embossed "ALdeS", affixed to the right of Santa Anna's signature. ANTONIO LOPEZ de SANTA ANNA The exiled Mexican General, in need of money, uses his land and palaces as security to issue 1500 bonds worth $750,000. In full: "Know all men by these presents that I Antonio Lopez de Santa Anna at present in the City of New York am indebted to___ or Bearer in the sum of Five Hundred Dollars which sum I promise to pay the Bearer hereof in lawful money of the United States of America on the twenty eighth day of June A.D. One thousand eight hundred and sixty eight in the City of New York, State of New York, with interest thereon from the twenty eighth day of June A.D. One thousand eight hundred and sixty six at the rate of seven per cent per annum, payable annually at the Banking House of ____ in the City of New York. 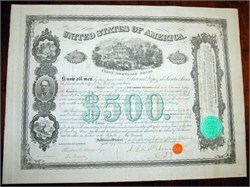 This Bond is one of a Series of fifteen hundred Bonds amounting to Seven hundred and fifty thousand Dollars, and the Bearer is entitled to the security derived from a Mortgage or Deed of Trust duly executed and delivered by the said Antonio Lopez de Santa Anna to Henry G. Morton and Virgil Whitcomb Trustees, and bearing even date with this Bond and covering several pieces of property in all amounting to about three hundred and seventy right square miles of land in the State of Vera Cruz, Mexico, together with two palaces and grounds one situated in the Island of St. Thomas and the other in Turbaco in the Republic of New Granada." General Santa Anna commanded the Mexican Army against the United States in the Mexican War. Defeated at Buena Vista, Cerro Gordo and Puebla, he was driven out of Mexico City by General Winfield Scott, but was recalled and served as Provisional President in 1847. After serving as President of Mexico from 1833-1836, 1839-1842, 1844-1845 and in 1847, Santa Anna was sent into exile in 1848. He was recalled and served as President for the last time from 1853-1855. Santa Anna again lived in exile from 1855-1874, returning to Mexico City where, two years later, he died in poverty and neglect at the age of 82. SANTA ANNA, ANTONIO L�PEZ DE (1794-1876). Antonio L�pez de Santa Anna P�rez de Lebr�n, soldier and five-time president of Mexico, was born at Jalapa, Vera Cruz, on February 21, 1794, the son of Antonio L�pez de Santa Anna and Manuela P�rez de Lebr�n. His family belonged to the criolloqv middle class, and his father served at one time as a subdelegate for the Spanish province of Vera Cruz. After a limited schooling the young Santa Anna worked for a merchant of Vera Cruz. In June 1810 he was appointed a cadet in the Fijo de Vera Cruz infantry regiment under the command of Joaqu�n de Arredondo.qv He spent the next five years battling insurgents and policing the Indian tribes of the Provincias Internas.qv Like most criollo officers in the Royalist army, he remained loyal to Spain for a number of years and fought against the movement for Mexican independence. He received his first wound, an Indian arrow in his left arm or hand, in 1811. In 1813 he served in Texas against the Guti�rrez-Magee expedition,qv and at the battle of Medinaqv he was cited for bravery. In the aftermath of the rebellion the young officer witnessed Arredondo's fierce counterinsurgency policy of mass executions, and historians have speculated that Santa Anna modeled his policy and conduct in the Texas Revolutionqv on his experience under Arredondo. He once again served under Arrendondo against the filibustering expedition of Francisco Xavier Minaqv in 1817. The young officer spent the next several years in building Indian villages and in occasional campaigns, while he acquired debts, some property, and promotions. In 1820 he was promoted to brevet captain, and he became a brevet lieutenant colonel the following year. In March of 1821 he made the first of the dramatic shifts of allegiance that characterized his military and political career by joining the rebel forces under Agust�n de Iturbideqv in the middle of a campaign against them. He campaigned for Iturbide for a time and was promoted to brigadier general. In December 1822 Santa Anna broke with Iturbide over a series of personal grievances, and he called for a republic in his Plan of Casa Mata in December 1822. After serving as military governor of Yucat�n, Santa Anna retired to civil life and became governor of Vera Cruz. In 1829 he defeated the Spanish invasion at Tampico and emerged from the campaign as a national hero. In the course of this campaign, he demonstrated several of his characteristic military strengths and weaknesses; he was able to pull an army together quickly and with severely limited resources, but he also combined elaborate planning with slipshod and faulty execution. He rebelled against the administration three years later and was elected president of Mexico as a liberal in 1833, but in 1834 he stated that Mexico was not ready for democracy and emerged as an autocratic Centralist. When the liberals of Zacatecas defied his authority and an attempt to reduce their militia in 1835, Santa Anna moved to crush them and followed up his battlefield victory with a harsh campaign of repression. In December 1835 he arrived at San Luis Potos� to organize an army to crush the rebellion in Texas. In 1836 he marched north with his forces to play his controversial role in the Texas Revolution. After his capture by Sam Houston'sqv army, he was sent to Washington, D.C., whence he returned to Mexico. He retired to his estates at Manga de Clavo for a time, then emerged to join the defense of Mexico against the French in December 1838 during the so-called "Pastry War." He lost a leg in battle and regained his popularity. He was acting president in 1839, helped overthrow the government of Anastasio Bustamanteqv in 1841, and was dictator from 1841 to 1845. Excesses led to his overthrow and exile to Havana. At the beginning of the Mexican War,qv Santa Anna entered into negotiations with President James K. Polk. He offered the possibility of a negotiated settlement to the United States and was permitted to enter Mexico through the American blockade. Once in the country he rallied resistance to the foreign invaders. As commanding officer in the northern campaign he lost the battle of Buena Vista in February 1847, returned to Mexico City, reorganized the demoralized government, and turned east to be defeated by Winfield S. Scott's forces at Cerro Gordo. Secret negotiations with Scott failed, and when Mexico City was captured, Santa Anna retired to exile. In 1853 he was recalled by the Centralists, but again power turned his head. To help meet expenses he sold the Mesilla Valley to the United States as the Gadsden Purchase and was overthrown and banished by the liberals in 1855. For eleven years he schemed to return to Mexico, conniving with the French and with Maximilian. After a visit from the American secretary of state, W. H. Seward, he invested most of his property in a vessel that he sailed to New York to become the nucleus of a planned invading force from the United States. Disappointed in his efforts, he proceeded towards Mexico, was arrested on the coast, and returned to exile. From 1867 to 1874 he lived in Cuba, the Dominican Republic, and Nassau. During this time he finally abandoned politics and wrote his memoirs. In 1874 he was allowed to return to Mexico City, where he lived in obscurity until his death on June 21, 1876. He was buried at Tepeyac Cemetery, near Guadalupe Hidalgo. Santa Anna was married twice, to In�s Garc�a in 1825, and, a few months after the death of his first wife in 1844, to Mar�a Dolores de Tosta, who survived him.